Veterans University is for veterans, servicemembers, their families, and anyone in our community interested in learning about how to improve the lives of veterans in a welcoming classroom environment. Veterans University is a one-day event covering a myriad of topics including: health care and disability benefits, exposure to burn pits, mental health, female veteran-specific topics, home ownership, senior-specific topics, and employment resources for veterans. Presenters include representatives from Veteran Service Organizations and the Department of Veterans Affairs. Presenters will provide a broad overview on each topic, followed by practical and detailed information on how to access the benefits described. Participants will also receive contact information they can utilize should they have difficulty accessing benefits on their own. There will also be a veterans' resource expo with many local organizations and agencies that serve veterans. Mark your calendar for Saturday, May 4, 2019 and feel free to share with anyone interested in the community. Let’s show our veterans how important they are by learning how to better serve them! 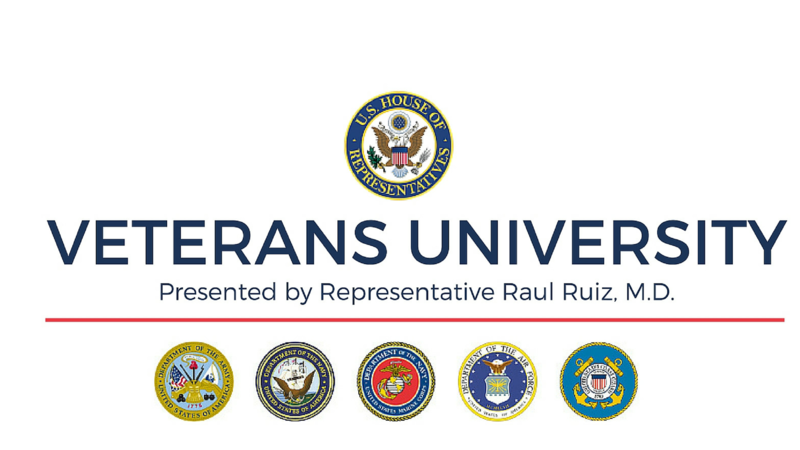 To stay up to date on Veterans University and other important updates from my office, please sign up for my e-newsletter. Please note that no meals will be provided at this event. Water will be available on site. What is the address and directions to the Westin? What are parking options at the Westin? Complimentary self-parking is available on site. You can reach the office of Representative Raul Ruiz, M.D. at 760-424-8888.